Liven up the mood of someone special by gifting this Pretty Off to School Hot Wheels Design Tiffin Set that carries all the elements to bring happiness. 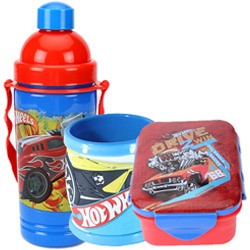 This Tiffin Set is combined with Hot Wheels Pattern Tiffin Box, Sipper Bottle and a Mug. It has some unique features like made from Non-toxic Plastic Material, Light in Weight, Easy to Wash and Carry and BPA Free. Capacity of Bottle is 550 ml. and Capacity of Mug is 300 ml.